This custom travel bag is design to meet airline standard for carryon baggage which has a maximum of 22 x 14 x 9 inches. 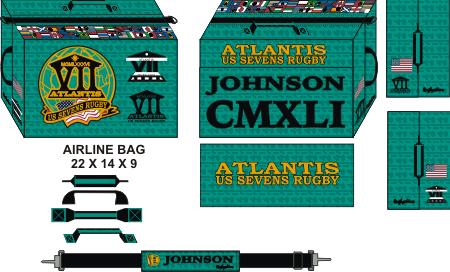 The classic rugby kit bag is as popular as ever and Made in the USA but with a twist! Made of strong 1000 denier polyester duck and is fully sublimated with straps made of heavy duty nylon webbing for durability. The bag features: 22 x 14 x 9 zippered main compartment with 22 x 10 in open flat side pocket (upgradable to zippered pocket), web carry handles on top and both ends and adjustable shoulder strap and uses oversized #10 zipper. This is a full 2772 cubic inches. Customize this bag with team or sponsor logo. Personalize the bags with player name on one side stripe and tour or event name on the other side. Unlike traditional canvas kit bags all over prints are possible. The possibilities art endless, add name, number and sponsors at no additional charge. With full sublimation we can add details never imagined before so let you imagination go wild to build a unique bag for your team. Our standard size is 27"x13". Other sizes available: 25x12 23x11. Call us to discuss your ideas. All features above are included in the price. Please provide camera-ready artwork. See our Custom Product Artwork page for details on preparing your files.